Video Robot, What does it contain? It’s almost easier to write what it does not contain. Here are greenscreens, animation figures. Several different templates audio library and much more. Yes, you can record your voice and edit it in the videos to sync. The shapes you can use, so the movements of the mouth fit the sound. I have to say that I am delighted to be able to work with video on my iPad. I also hope that I will be able to boost some of my older videos. In fact, there are many exciting things to play. Fortunately, you can not make such long videos. This kind of thing becomes fast boring to look. It’s not a cartoon you’re doing. But like small info videos that are easy to make. You can take advantage of it if you want the message about your new context. In fact, for the tool to work, you do not need to buy the additional programs they try to do. But some of what you can consider is to buy some pictures and some music that you have the rights to use. Here are so many tools that I can not wait to get started right now. Right now I’m so excited and excited that I can not find fault entirely. Unfortunately, the videos on the sales page are very long to charge. Unfortunately, it is also a bit slow in the member area. You will get the mp4 file on your computer to fill it up. It’s not entirely online it’s happening, unfortunately. You get a lot off upselling. 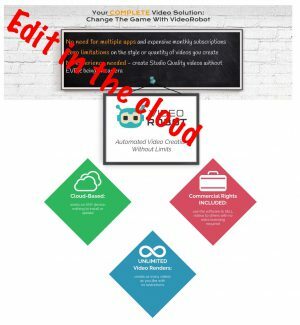 Who can take advantage of Video Robot? I love to make the video, so I do not hope it will spend too much of the time I spend writing and judging other products. But right now, it’s just fun to create this kind of video. If you have seen a little more of my work, then you will also know that I think it’s amusing to make videos. I’m going to create more videos, and it can run on my iPad. I, unfortunately, found out that I can not share the videos on my iPad yet. It was challenging to keep up the speed. The files are also stored well on your computer. But like other online products, you can pick up your link on JVzoo and even start promoting it. I have found it myself on a website that I follow and have followed for many years. So yes you can earn money writing about this. But you can almost do that with all the info products you find online. Most come from more or less questionable networks. However, you’re on video online and like working on animations to get straightforward access to this. 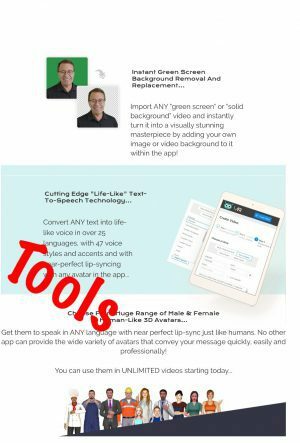 Just after I paid, I do a webinar that should be able to show me some of the fun and fun features of this app. The intro videos here are about how to market the product. It annoyed me a little bit. Here’s no living member area, just an editing tool. But that’s also what has been my purpose of acquiring it. Here is an email that you can write. But the most significant advice I think you will get from JV Zoo. Here’s a lot of support to the developer. The videos are more about the fact that they would like you to buy some more of their products. But they have just sent an email where there is an issue that is. They’ve been smart. Cut the tool into several parts so you’ll have to buy extra parts for example if you want your videos shared on social media. I only use the first version of the software. You do not have to buy all the extra tools they try to sell you. 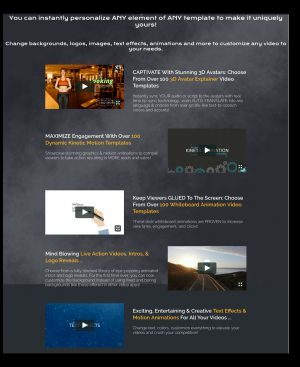 You can only do the video tool alone. So make sure you do not just buy out. You do not need the other acquisitions. Yes, what do I think? The video is fun to do, and I have to admit that I have a little fun when I test the program so I can describe it for you. Right now, it has excellent news value. But I think that in a few months we will see that the internet is with this kind of videos. Right now it’s entertaining to play with me. But it’s going to lose some of the value and become another toy that I really will not use in the daily. The provider knows that too, and it’s also the reason they try to sell more or less relevant programs. 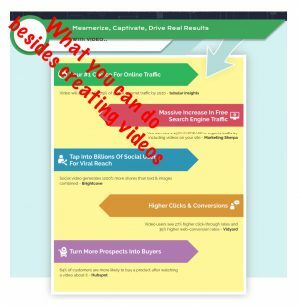 They promote that you can create videos in a short period and sell them dearly on different online job pages. To me, it’s more a toy that I might want to plant in some of my articles. Fortunately, it does not take much practice to learn how to operate the program. That’s probably the most important reason they try to sell it as a marvelous product, as even new online can earn a lot of money. I know from experience that the world looks a little different than that. Something that I think is funny is the characters you can insert and edit. Yes, you find a style and a voice, then you can just add some text that the character reads. Now I’ve only had a couple of days and once again I’ve tested something that had taken more of my time than I had hoped for before I bought it. You can also add a lot of different types of text. You have the opportunity to combine it with the handwritten whiteboard. As you understand, I’m looking forward to picking up my articles with some small videos. I like to share my thoughts with you, and I will continue with that. But it’s still not a real business, and I’m terrible to believe you can only create small videos with it. Small videos that you can sell for expensive money. In fact, much more work should if you want to profit online. Not a real business model, even though the developer claims it. Just because it’s new does not mean you’re on the search. But it must be over the next couple of months where I want to build video for my articles. Nor do you build a fire. No, it’s something you should make sure to create. It can easily as part of your brand. But you must create the authority yourself. If you want to make an income online, you need a completely different setup. ==>>I would like to show you how. But have just a few questions that you should talk to yourself. Are you willing to create a real business? Ok, on having a place online? A place where we can come and learn from you? I offer you the opportunity to get an insight. Ten lessons and two websites. Teaching as you may risk paying expensive money elsewhere. White and free no credit card information. I’m waiting for the other side, along with several thousand others, who are exclusively there to help each other. I just want to get a little warning. Take it easy and use the first week to find out if you want to implement everything you can learn here. It is a lifelong plan that will give you a break. You will also find that you only see a purchase. Yes either you are the free or premium member. There is also no deadline for when to get started. So, start learning, implement and then create a space for yourself and do the work. 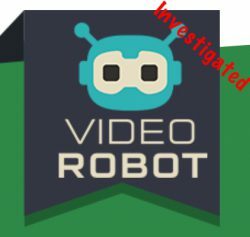 Video Robot How Highly Rank It? I’m getting tired of the claim that you can earn a fortune by a simple tool. 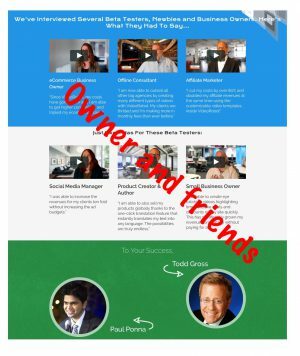 The big affiliate network with relatively inexpensive products that aim to sell you even more. That I’m a bit annoyed does not mean I feel cheated here. No, I’m about how to use some of the features for both of my old videos. But also to create new ones. I bought to test it, but I’m going to keep it to burn my fire a little. The video is probably not something I would recommend to build yourself up over. Unless you like me feel it’s a good and fun strategy. To me, it’s my preferred traffic strategy. I enjoy the role of video producer a little. Creating things online should be fun. What’s best for you is the very best strategy for you. I think the video medium is a lively and fun way of conveying context. Therefore, it is also very natural that I would like some opportunities to get some intro with animations. It makes me feel I give a little more of myself. A video is not a shortcut. So my advice is that you should use your common sense if you buy something to promote your business online. You are going to spend money on useless things. Still, you risk losing your precious time. Time from the time you have the opportunity to create something valuable. But as a toy and to refine your videos, it’s a pretty good toy. Let me put your attitude down in the comments field. While you’re here, you can not even hit one of the social buttons. Thanks for sharing video robot with us. It seems you are really enjoying it, and that it is a fun way to make fidoes. Would you say this is your number one recommend program for making any kind of videos online — or just the fun cool ones? Also have you used camtasia, and if so what do you think about it when compared to this? Thanks for the comment. I do not really see this as a real tool for anything other than making some short intro videos. It’s fun to play with and you can very easily and quickly create a little funny video. But it requires a little more equipment to make real Pro videos. I have not yet tested camtasia. I am using screenshot o magic myself. It is cheap and provides a reasonable quality. I have a little like buying what I have skills for.